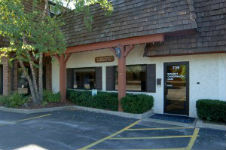 Bennett Chiropractic Care is located in downtown Libertyville, halfway between Milwaukee and Chicago. Our office building is located at the Metra Crossing and across from the Liberty Theater. We’re on the main street — Milwaukee Avenue/Highway 21 — in this part of Libertyville. The local bus route stops right in front of our office. If you’re driving, we have ample parking available for our patients.